Deep low frequency tremors are indicators of slow slip transients in the brittle-ductile transition zone along subducting plates. Investigation of comprehensive tremor activities is therefore an important issue for understanding the seismic/aseismic characteristics in transition zones. Here, we focus on the radiated energy from tremors to reveal the along-strike heterogeneity in the strength of tremor patches. Based on a tremor catalog that more accurately evaluates radiated energy, we examine the spatio-temporal activity of tremors accompanied by slow slip events (SSEs) in western Shikoku, southwestern Japan. The new finding of this study is that the energy radiated from tremors is positively correlated with the speed of tremor migration front and the slip rate along the plate interface during a SSE. This can be qualitatively explained by a stress diffusion model, which consists of along-strike heterogeneities in the effective strength of tremor patches embedded in a ductile shear zone. This effective strength heterogeneity is supported by a lateral variation in the stress drop of a SSE; it is consistent with the fluid pressure distribution along the plate boundary fault and the tidal sensitivity of tremors. Accurate evaluation of tremor activities, especially the radiated energy, can be used to infer the spatial distribution of the strength of tremor patches in transition zones worldwide. 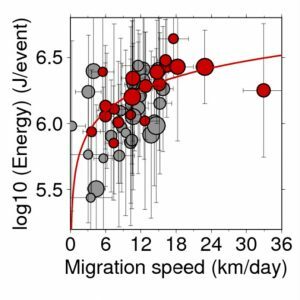 Migration speed and mean energy rate. 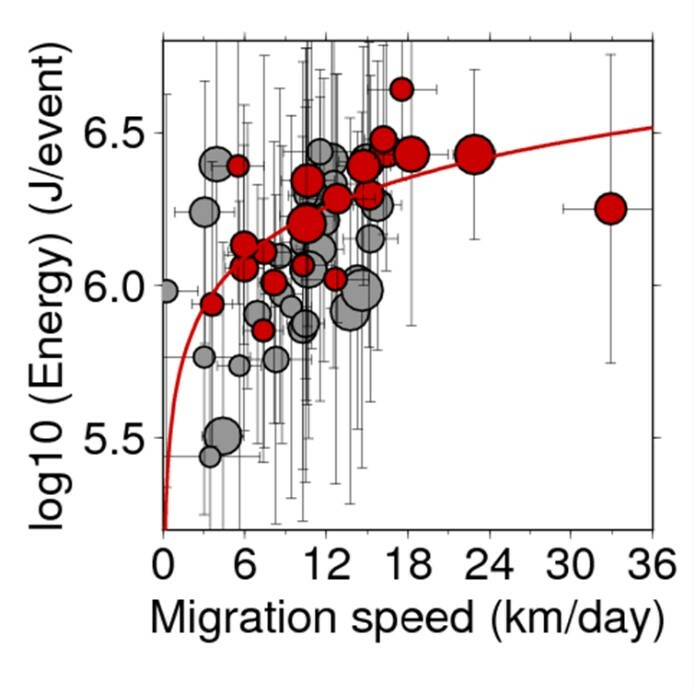 Migration speed and mean energy in each tremor group including more than 25 events. The magnitude of the symbol shows the number of tremors in each group and the error bar is the 1-σ estimation error for both migration speed and mean energy. Red points correspond to the tremor groups that show a clear parabolic migration, while black points indicate tremor groups whose migration front does not obviously expand in diffusive manner. The red line indicates the analytically obtained relation by fitting all the red points. This figure is created using the GMT (Generic Mapping Tools, http://gmt.soest.hawaii.edu/) software package32. Schematic model of tremor patches at ETS source depth in the Nankai subduction zone. Strong tremor patches caused by low fluid pressure in the western part radiate large amounts of energy, causing fast tremor migration. 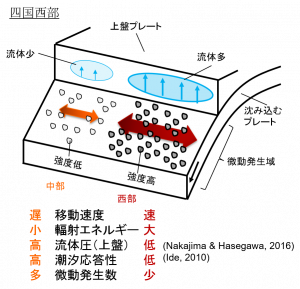 On the other hand, a high fluid pressure in the central part weakens the strength of tremor patches, resulting in low energy radiation and slow migration.